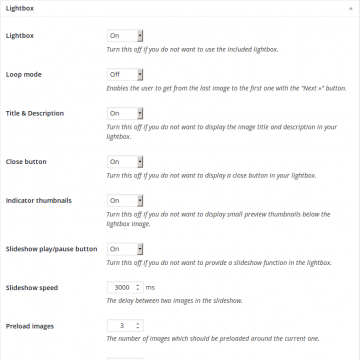 All links - regardless if text or image - pointing to an image will automatically displayed in a responsive lightbox. You do not need to care about any tag attributes or link classes - the plugins takes care about that for you. When using the [gallery] shortcode the images will get a "previous", "next" and a slideshow button. The gallery itself uses your themes gallery style and keeps your common identity untouched. Import and export directly via the official "WordPress Importer" by Automattic Inc. In the lite edition of the plugin you can take a look around, you can create three galleries and you can check the lightbox functionality. On several places in the plugin you will find a notice that this or these function is included in the pro version only. Please notice that there is no support available for the free version. You can find the download here. Scroll to the "Permissions" box and setup the initial user permissions for each group. 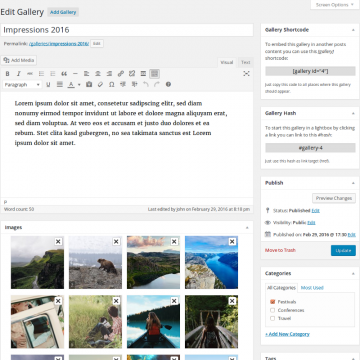 In WordPress 2.5, the gallery feature allows the user to add an image gallery to a post or page on your WordPress blog. The easiest way to insert the shortcode to your contents is to use the gallery button in your WYSIWYG editor. 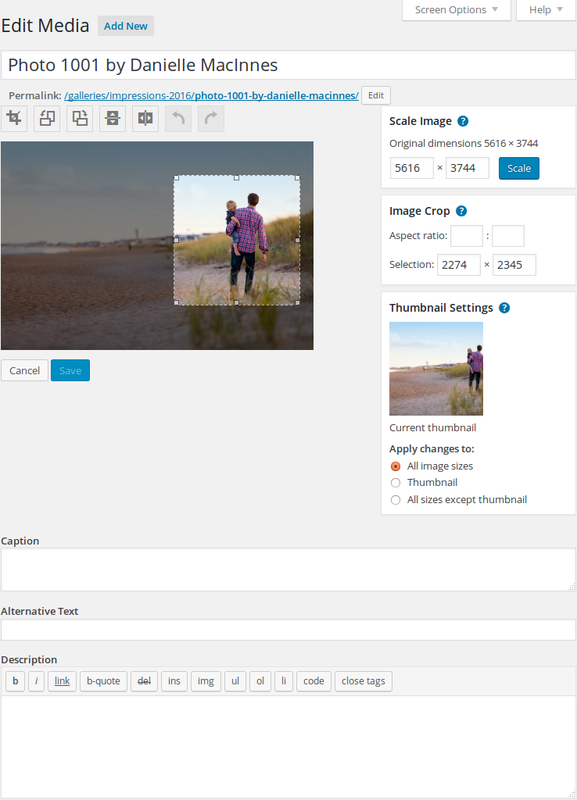 The [gallery] shortcode is completely supported by Gallery Manager Pro and you do not need to change the posts or pages you created in the past. The gallery management needs to be activated via the options page. 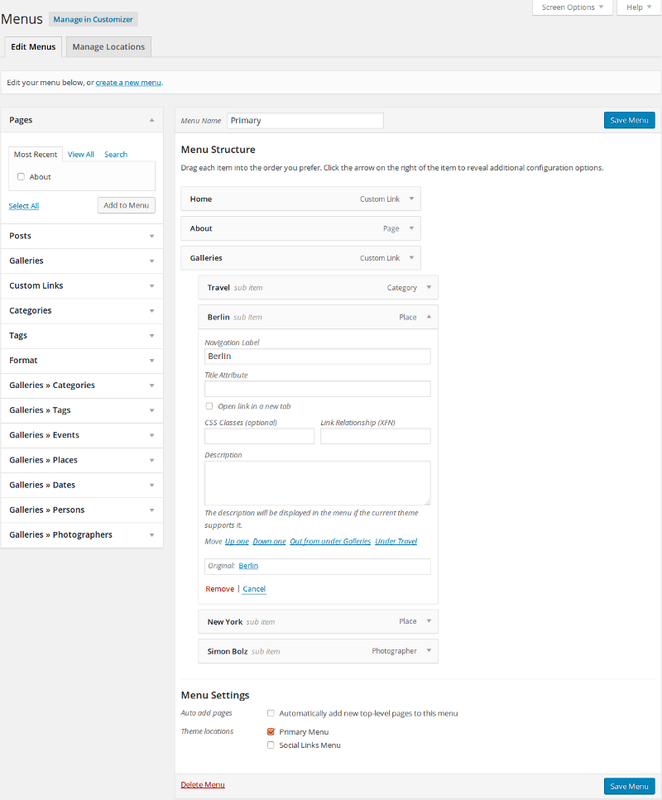 You can find the options page in your WordPress backend -> Settings -> Galleries. Scroll down on the options page to the "Permissions" box and click the title to open the box. 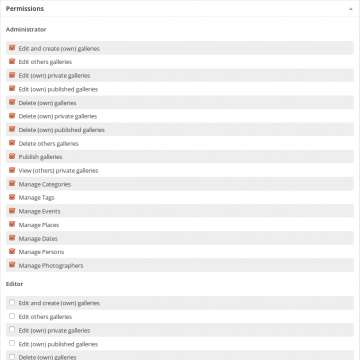 Tick all permissions of your user group to activate the features you need for the gallery management. 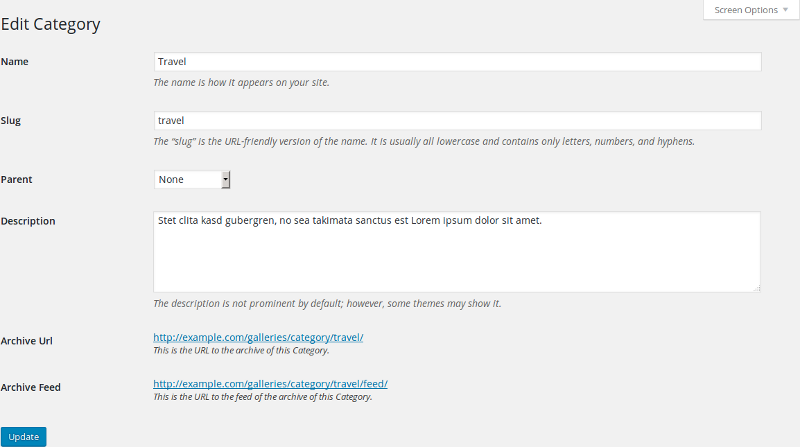 After setup the Gallery Manager user capabilities there is a new admin page in your menu: "Galleries". Click on "Add Gallery" to create a new gallery. The usage and handling of the interface is very similar to the edit post or edit page screen. Enter a title or name for the new gallery. It will be visible to website visitors like the title of a post or a page. 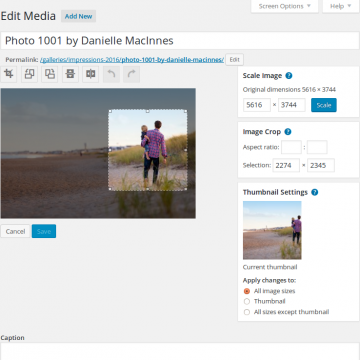 In the "Images" meta box you have the ability to upload new images via Flash or HTML uploader. With the "Add Images" button you can upload images from your computer or import existing ones from the media library. Click on an image to add or modify its details. Gallery previews usually contain some random images which represent a gallery on archive pages. They are similar to text excerpts of posts. In this section you can choose elementary design options to display a gallery like the number of columns and the thumbnail size. The owner of a gallery is similar to the author of a post. If a user has the right to edit others galleries he is able to change the owner of a gallery to someone else. The featured image is the main presenter of your gallery. If you use post thumbnails somewhere in your website the theme should use the featured image of the gallery on this place. Taxonomies for galleries are similar to categories and tags for posts but they are not the same. Gallery taxonomies are separated from the post taxonomies. 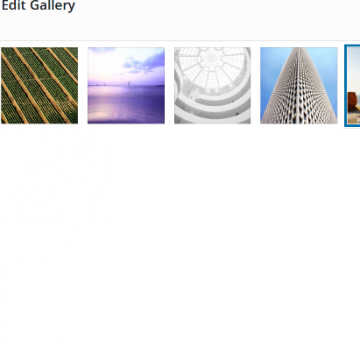 You can use them to categorize all galleries and to build archives and RSS feeds. 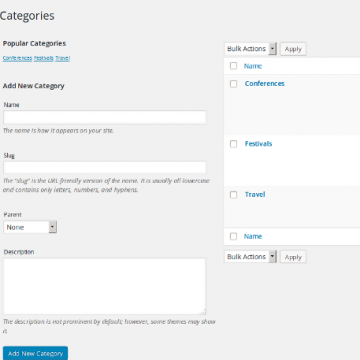 To activate the taxonomies go to the options page and take a look on the "Taxonomies" option box. Tick the ones you want to use and hit the save button. Please do not forget so set the user permissions to manage the new taxonomies in the "Permissions" box on the options page. 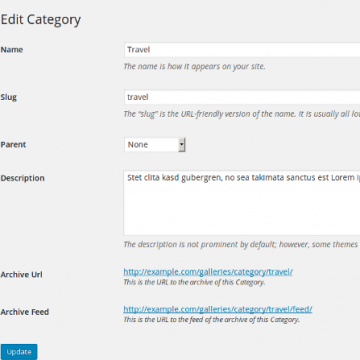 Managing the gallery taxonomies is as easy as managing categories or tags for posts. 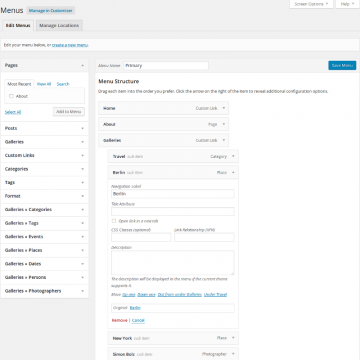 Gallery Manager Pro uses the WordPress embedded user rights and capabilities system to control the access to galleries, taxonomies and options. You can change the settings directly on the options page without any external plugin. By default nobody has any permissions expect the admin who is able to change the settings on the options page. So the first step after activating the plugin should be the user permission configuration. 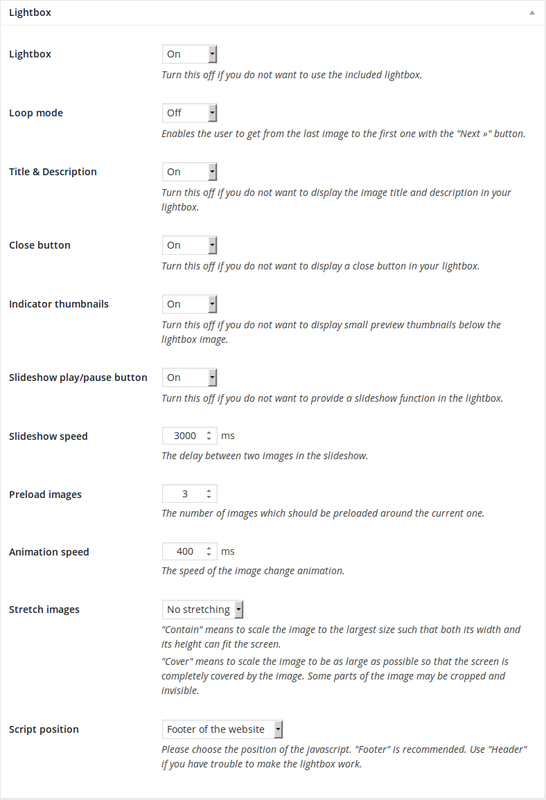 Go to your WP Dashboard -> Settings -> Galleries. Scroll down to the "Permissions" options box and open it up with a click on the box title. Then you can set the available user rights for all existing user groups. Nothing is cooler than a plugin which plays well with all the great WordPress features. 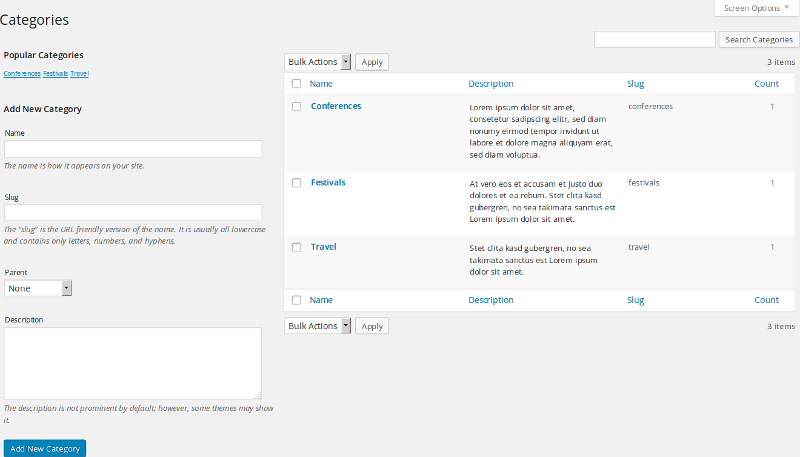 You can add all galleries or taxonomies to your custom menus. Go to your WP Dashboard -> Appearance -> Menus. Gallery Manager Pro generates a gallery archive for every gallery taxonomies you created. You can find the URL of each archive below the "Edit Taxonomy" page. The [gallery] shortcode is used in a post or page to display a thumbnail gallery of images attached to that post. It can be used in its simplest form like this: [gallery]. All official options are supported by the Gallery Manager Pro plugin. You can find the detailed documentation here. Gallery Manager Pro comes with some cool widgets which displays galleries and taxonomies in your sidebars. The "Taxonomies" widget displays your gallery categories, tags, events, etc. 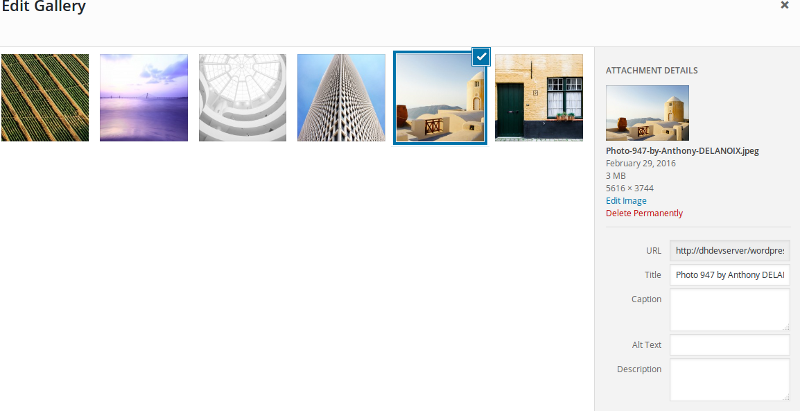 The "Taxonomy Clouds" widget displays your gallery categories, tags, events, etc. as cloud like you know it from post tags. This widget displays random images from some random galleries.